Every year our 3rd year Biochemistry students have to produce posters on hot topics in Biochemistry. And every year I ask colleagues to contribute some ideas for this list of topics. You can find last year’s list here; as it is still pretty current, we will just extend it below. And you can contribute to this year’s list via Twitter or in the comments below. This is the title of a 3x1H45 course which I will give early September at the European School On Nanosciences and Nanotechnologies (ESONN) in Grenoble. The focus is on inorganic nanoparticles, e.g. gold, silver, iron oxide, quantum dots for biological applications. It will be the third year I give this course. It is a small class format with 21 students coming from all over the world, from New Zealand to South Africa, Denmark, Italy, India and France. I have opted for a mostly discussion-based format centered around selected publications. I am asking readers of this blog (optional but very much welcome!) as well as students registered for the track B of ESONN15 (mandatory) to suggest at least one article for discussion. To suggest a paper, simply add a comment to this post with a reference (link to the paper would be even better). Papers can be selected because they are historic landmarks in the field; or because they are recent ground breaking discoveries; or because they raise important questions that we need to discuss to move forward. Please provide one or two lines of justification for why you think we should discuss this paper. I ran today a one hour training session for researchers at the University of Liverpool about online presence. About 20 researchers from very different backgrounds (from language to physics, chemistry ecology, etc) mostly at the post-doctoral level attended. We started with a round table where I asked each participants to tell which social media they use and what they expected from the workshop. Many were Facebook users, mostly for personal networking, while a few had started to use it for professional networking too. Research Gate and LinkedIn were prominent as well (often with low level of usage). Google+ had one mention. One or two had limited experience of Twitter. One question that came several times was the personal versus professional limit. How much should we keep private? I don’t think there is any easy answer to this question, except that it is useful to understand how each tool you use work and therefore how to control what you are actually sharing or not. In that context, Facebook is a bit of a pain while Twitter is simple: everything is public so don’t share what you want to keep private. I don’t actually agree with Vladimir (you can check my reply to him on Twitter), but thanks to him for this nice demonstration of the power of real-time conversation and crowdsourcing of information. @raphavisses the only social media I do is Twitter (and blogging). Best bit is belonging to a “virtual faculty” of PIs, PDs, students. @raphavisses thanks. IMO the main positive point for twitter is the instantaneous simultaneous conversation. @raphavisses I find following and getting involved with conferences you can’t get to via their hash tag pretty handy. @raphavisses and following journals effectively makes it an RSS feed of useful articles and discussion. @raphavisses just tell them your own story, how is it benefitial (or not) for you personally. Time invested / results obtained, etc. @LivResearcher @raphavisses I attended the workshop today, and feel the need to tweet!. It was very good and informative. I attended a teaching training session today. Here are the notes taken by Violaine Sée (who also attended). Feel free to suggest other tools in the comments below. 1. Padlet: alternative to post it note, record of engagement, visual record. Sign up, then get a discussion wall. Can be used to get ideas floating from students, answering a question etc. Be careful they might want to post silly things. Can be used to share resources for film making for example, and then people can add their own. Create a room either for single session or entire module. Set guidelines before you start. Useful to get fast feedback or questions during the lecture or end of the lecture. Only micro messages. You can embed the link into vital, so the discussion is recorded. On line discussion. Upload a document and then people can contribute. Good for peer assessment. Better for smaller discussion. Upload their videos. Others can make Audio or text comment at specific points in the video. Need to register for posting. Can only post 5 items at a time for commenting (in the free version). Can be used to provide feedback? Zaption: can upload YouTube videos and then allow for commenting. Good for obtaining thoughts and feeling of students. Multiple ways students can respond: web interface, text message Free account is limited to 40 responses. Possible to display wall answers live but also nice word cloud representation of multiple answers. This is the title of a 3x1H45 course which I will give early September at the European School On Nanosciences and Nanotechnologies (ESONN) in Grenoble. The focus is on inorganic nanoparticles, e.g. gold, silver, iron oxide, quantum dots. It will be the second year I give this course. I have opted for a mostly discussion-based format centered around selected publications. Last year, I chose the publications and distributed them during the lectures, but let’s try to get more organised. I am asking readers of this blog (optional but very much welcome!) as well as students registered for the track B of ESONN15 (mandatory: deadline Friday 28th August) to suggest at least one article for discussion (depending on the success of this crowd sourcing effort, we might or might not be able to discuss all articles). To suggest a paper, simply add a comment to this post with a reference (link to the paper would be even better). Papers can be selected because they are historic landmarks in the field; or because they are recent ground breaking discoveries; or because they raise important questions that we need to discuss to move forward. One line justification for selecting the paper would be great. 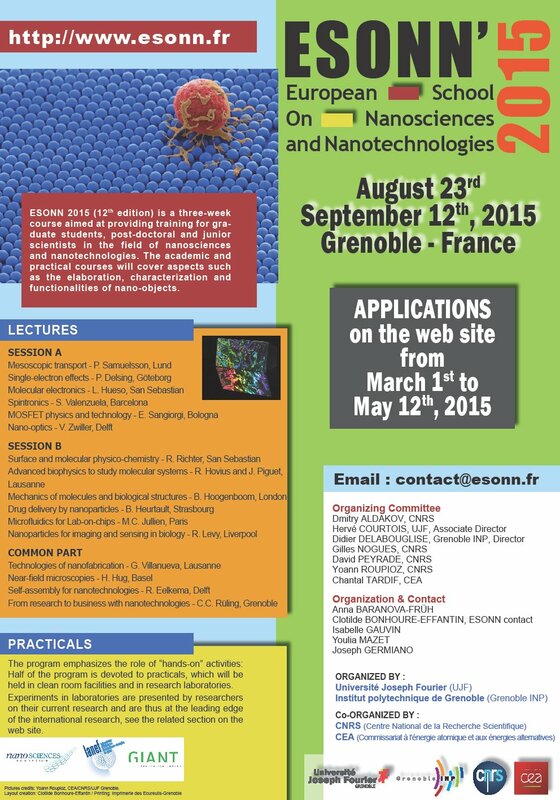 Applications are open for the European School On Nanosciences & Nanotechnologies, Grenoble, August 23rd September 12th, 2015. I will be one of the lecturers in session B.
ESONN 2015 (12th edition) is a three-week course aimed at providing training for graduate students, post-doctoral and junior scientists in the field of nanosciences and nanotechnologies. The academic and practical courses will cover aspects such as the elaboration, characterization and functionalities of nano-objects.